The GSI Destination Kitchen Set 24 is an All-in-one 24 pc. Kitchen set that has every utensil for any gourmet expedition, including 4 full sets of cutlery. Pivoting tools rotate from stored to working positions. 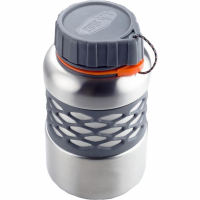 The GSI Glacier Stainless Bottle Cup is designed to slip over standard 1 L water bottles or to store your fuel canister in it. Folding bail handles provide further space-savings and convenience. 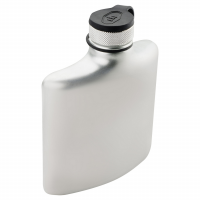 The GSI Glacier Stainless Hip Flask has a durable polished Glacier Stainless finish for a lifetime of reliable use. The screw-down, hinged top and filling funnel assure that you won't waste a drop of your favorite beverage. The GSI Glacier Stainless Pint Set utilizes durable Glacier Stainless steel for years of reliable service whether at home or in the backcountry. Exceptionally easy to use, the GSI Glacier Stnls Mini stovetop Espresso maker brews one double shot (2.5 fl. oz.) servings in 90 seconds. Ultra-rugged, Glacier Stainless construction offers years of reliable brewing.